** Click Here to check out our Mini 90 as a replacement for the sold out XL 50. The Mini 90 is the same body, tires and controls as the XL 50 with a bigger engine that is governor controlled, so you allow them to go as fast or slow as you want. 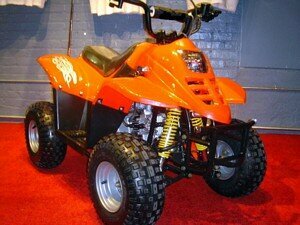 It is a perfect replacement to still get your child the ATV they want. Comes with a Free remote control kill switch, alarm, Raceway checkered flag and battery charger . All wheels match the ATV color with the exception of the camo and black models which come equipped with silver wheels. Raceway ATV would like to introduce our new XL-50cc ATV. When it comes to mini ATV imports the XL 50cc ATV stands in a class by it's self for many reasons. For starters the XL 50cc mini ATV has a full sport double A-Arms front suspension. Most mini 50cc ATV's do not offer a front suspension at all. Our XL-50cc ATV also comes with a rear mono shock with good travel that produces a comfortable soft ride on just about any terrain. The Raceway XL-50cc mini ATV also has a rear disc braking system. This braking system is operated by a soft and easy to pull in hand brake lever. We at Raceway were very pleased with the quick response of this brake system. The engine in our XL-50 mini ATV is a 50cc 4 stroke (straight gas no oil mixing) This 4 stroke engine is very easy to operate and is also very powerful and durable. The engine design of our XL-50 was copied from the older Honda 50cc engines. These engines were built to take abuse and last! 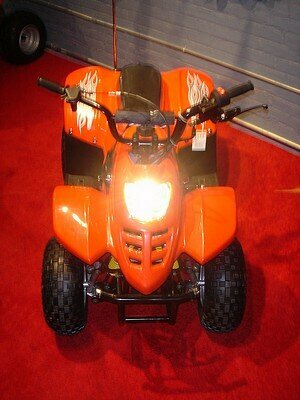 The transmission in the Raceway XL 50cc ATV mini is a 4 speed semi-automatic. This easy to operate 4 speed has a gear pattern of all down, simple to learn with the benefit of have the power of a geared transmission. You can also use the XL 50cc mini ATV like a fully automatic by placing the XL 50 ATV in one gear, remove one small bolt at the bottom of the gear shifting lever and this will allow you to slide the gear shifter off the ATV. Buy Your Mini 50 ATV Today, From The Best! From our years of experience at Raceway ATV a gear unit is much better then a full automatic for many reasons. If you have any questions about this please call our toll free number and we would be happy to explain. 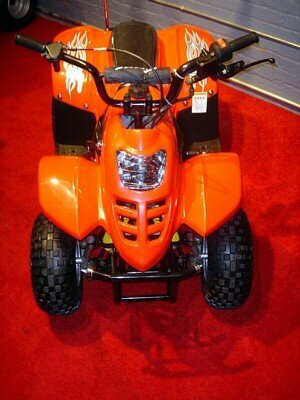 The Raceway XL 50 is a perfect mini size ATV. Not to small and not to big! Perfect growing room from foot panel space to power and speed. 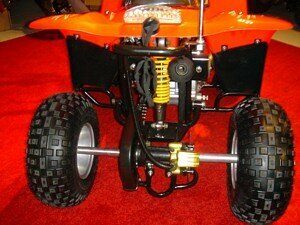 The XL 50cc ATV also comes standard with a speed limiter screw located on the gas throttle to govern it's speed. 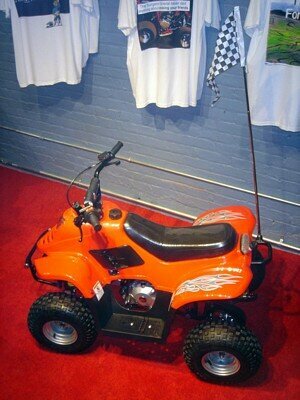 The mini ATV can be governed down to about 5 mph, with a Max speed of about 28 mph. 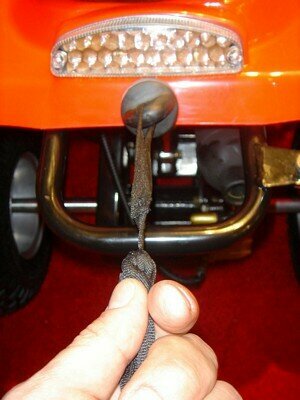 Our XL 50cc mini ATV also comes standard with a rear safety pull tether kill switch. The XL 50 also has an impressively bright headlight with an on/off light switch on the handle bars. The XL 50 mini ATV has a working taillight that stays the color green whenever the ATV is running and turns red when you apply the brake. Other great features on the XL 50cc mini ATV are: Free adjustable Raceway checkered flag that mounts to the rear on the ATV. Free wall plug in battery charge encase your battery ever dies. Easy to access manual choke lever right on the left side of the ATV. 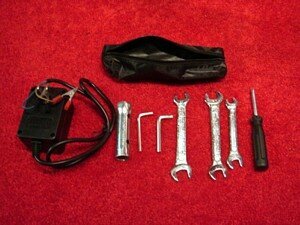 Chain and rear disc brake guard, basic tool kit. Let us do the research and you do the riding! Raceway ATV guarantees satisfaction with our 15 day return policy.